Sip Marine designs and produces high-end propellers, which are characterised by high efficiency and very low noise and vibration levels. In ship’s propulsion, increasing demands are placed on performance, comfort and sustainability. In various market segments, such as super yachts, high speed craft and inland navigation, our propellers have proven their very high efficiency and very low noise and vibration levels for a long time. The experience built up by Sip Marine is also applied in other sectors, such as work boats, fishing, merchant shipping and dredging. The result: maximum performance, comfort and sustainability due to top design, excellent materials and accurate production. With every design we will get the maximum of thrust and efficiency from the installation, so you’ll make optimum use of the installed engine power. By applying extensive analysis tools, we are able to accurately determine the behavior of the propeller in the flow around the ship and to optimize the interaction with the ship for minimum vibration and cavitation behavior. This leads to very high levels of comfort and minimal noise load on board, in any application whatsoever. A good propeller is sustainable; the optimum efficiency ensures that the fuel consumption is limited to the absolute necessity. Low noise and vibration levels prevent fatigue of people and material, and the prevention of cavitation leads to longer life of propellers, rudders and nozzles. The development of the ship’s propeller has undergone enormous (r)evolution in recent years. Ever faster computers and advanced software have made it possible to simulate the hydrodynamics of the propeller as in operation under the ship. Large steps have also been taken in the production process. Automated and robotized production and machining of propellers is used intensively. The cross section of a propeller blade forms a profile, just like the section of an airplane wing. The shape of the profile determines how the pressure of the circulating water is distributed and thus the pressure distribution and the cavitation behavior of the propeller are determined. When using only standard profiles, the pressure distribution can hardly be influenced. Varying the profile shapes parametrically, enables big leaps in optimisation of pressure fluctuations and cavitation behavior. Sip Marine therefore does not use standard profile forms. With us, each profile can be adjusted at any position in the blade, in any conceivable shape by varying e.g. the thickness and curvature distribution. The profiles are optimized to create the lowest possible pressure fluctuations, minimized cavitation behavior and at the same time keep maximum thrust. 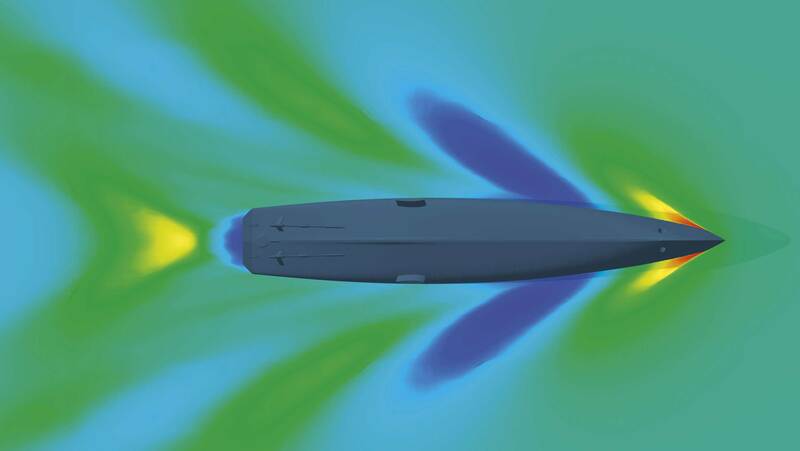 In a simulation computation, SIP Marine can rotate the propeller in any design variant, in the velocity field so that performance and cavitation behavior becomes visible. This increases the certainty of an optimal design and prevents surprises during the trial run. SIP Marine makes intensive use of these modern techniques to realize the best propeller possible for your ship via the unique 5 step process. 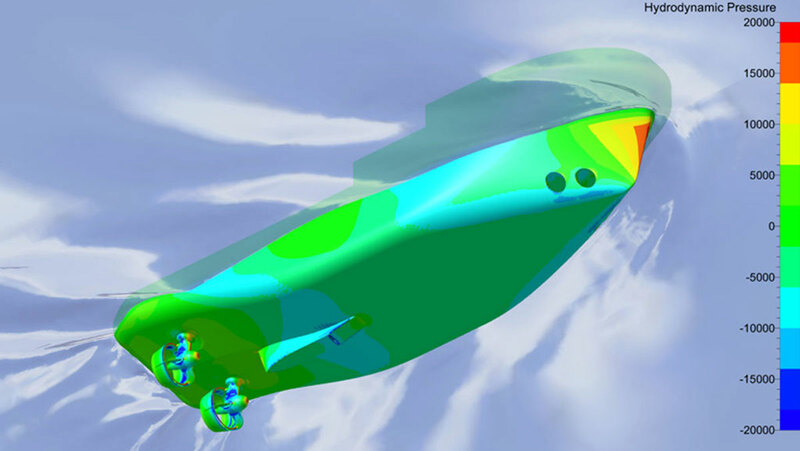 With our in-house available CFD tool from Fine™/Marine we can compute the pressure distribution and water circulation around the ship and determine what the velocity field on the spot looks like. The speeds and directions of the flow in the area of propeller rotation are of great importance in the optimization of the propeller design. Various basic parameters in the propeller design, such as chord lengths and pitch distribution, can be adjusted. SIP Marine propellers are produced by selected partners in every desirable finishing class according to ISO 484; from Class 2 for simple applications to Class S for yachts and naval application, high speed applications and extreme noise requirements. Our Class 1 and Class S propellers are CNC machined to ensure exact realization of the profile shapes and the highest level of finish. We can supply our propellers in diameters up to 6500 mm and 40 tonnes casting weight. Delivery in accordance with the requirements of the most renowned class agencies, such as Bureau Veritas, Lloyd’s Register, DNV-GL, ABS, RMRS and others.